From its early days, the agency has been a family-oriented "people place." Picnics, sports and social events are among the agency's traditions. Today, Statistics Canada continues to value its employees and to support diversity among its workforce. In 1945, Sedley A. Cudmore, the Dominion Statistician, asked his senior managers to develop a constitution for a staff organization that would deal with recreation facilities, working conditions and morale in general. The request led to the establishment of an Advisory Council. In 1956, the Council was split into a working conditions committee and a staff association responsible for sports, social and recreational matters. 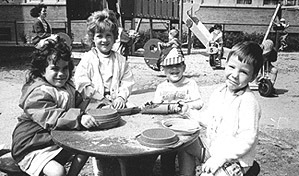 Since 1988, the Garderie Tunney's Daycare has operated in the Main Building for children aged six weeks to five years. It has a maximum capacity for 50 children and is operated by parents on a non-profit basis. In 2009, and again in 2010, Statistics Canada was named one of the Top 100 Employers in Canada by Maclean's magazine. Statistics Canada was ranked among the top 10 family-friendly employers and selected as from among 2,100 organizations as one of Canada's leading employers in diversity initiatives.